Before you hit the Dubai Mall or dive into Dubai’s vibrant nightlife scene, it’s worth getting a handle on the local currency. The official currency of Dubai is the United Arab Emirates dirham, which is officially abbreviated to AED and is commonly shortened to Dhs or DH. Each dirham contains 100 fils. 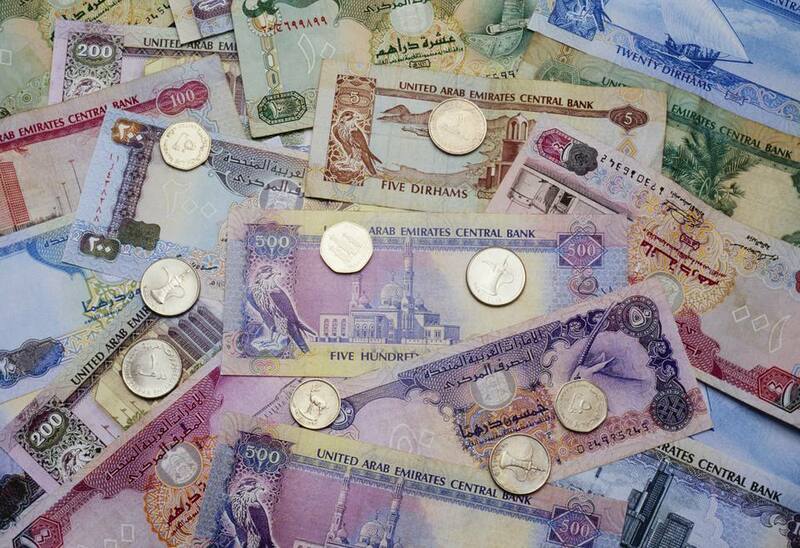 Dirham notes are available in denominations of 5 (brown), 10 (green), 20 (blue/green) 50 (purple), 100 (red), 200 (brown), 500 (navy blue) and 1000 (green/blue) dirhams. You’ll generally only see 1 dirham, 50 fils and 25 fils coins in circulation, with most stores rounding up to the nearest 25 fils. Try to carry smaller notes with you—not only are they handy for tipping, it can be hard to get change of anything larger than a 100 dirham note in taxis and some convenience stores. The United Arab Emirates dirham first came into circulation in May 1973, 18 months after the formation of the UAE. The word ‘dirham’ is derived from the Ottoman unit of mass, ‘dram’, hailing from the ancient Greek coin ‘drachma’, which was widely traded during the Byzantine Empire. Since 1997, the United Arab Emirates dirham has been pegged to the U.S. dollar at the rate of 1 dollar to 3.6725 dirhams. As most of the world’s currencies aren’t pegged to the dollar, you should expect to see daily fluctuations when trading in anything other than U.S. dollars. You should have no trouble exchanging your local currency into dirhams. The market is tightly regulated here, so there’s little chance of being taken for a ride. And as Dubai is such a massive transit hub, most money exchangers trade in a broad range of currencies from around the world. For the best rate, exchange a small amount at the airport to cover tips and taxis, then make a larger exchange once you’ve reached the city. Shopping malls are one of the easiest places to exchange money in Dubai, as they generally have banks and money exchange counters. You may wish to shop around for the best rate, as money exchanges often offer a better deal than the banks. Banks are generally open Saturday–Thursday, 8 a.m.–1 p.m. (closed Fridays), but as Dubai is a late-night city, you’ll find many of the currency outlets in malls stay open until late in the evening. Dubai is also home to thousands of ATMs, conveniently located in shopping malls, metro stations, supermarkets and in air-conditioned cubicles on the street, generally allowing you to withdraw dirhams directly from your personal account for a small fee. While it’s great to have cash on hand for tips, taxis, and bargaining in the souks (markets), you won’t need to carry wads of notes for larger transactions. Major credit cards including Visa, MasterCard, and American Express are widely accepted in Dubai’s hotels, shops and restaurants. There are no hard and fast rules when it comes to tipping in Dubai, so while it is customary to tip it is by no means compulsory. As a guide, if you’re happy with the service at a restaurant, bar or café, tip your server 10 to 15 percent, even if a service charge is noted on the receipt. For taxis, round up to the nearest note or offer a 5 or 10 dirham note. Most taxis don’t accept credit cards. Hotel staff and valets often receive 5 to 10 dirhams as a tip, more if they are tasked with carrying heavy luggage. For spa and beauty treatments, 5 to 10 dirhams is sufficient for short treatments, such as a manicure, but you may want to give 10 percent for longer treatments, such as haircuts and massages. In Dubai, you can get almost anything delivered at any time of day or night. Fancy a can of soda or a snack at 3 a.m.? Just call down to the nearest convenience store. To show your appreciation for the service, allow your delivery driver to keep the change or offer 5 to 10 dirhams, even if a delivery charge is added to your order.